Above: Teammate Erika (above right) was recently hired at this school and works with children with learning disabilities, physical disabilities and some who have behavioral problems. 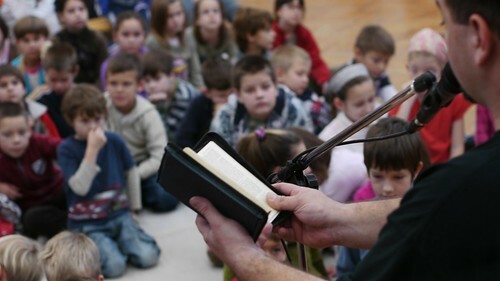 Above: The part of our show when the father pulls out the Bible to read the Christmas story to his kids. 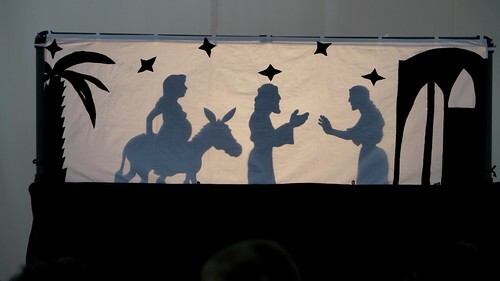 This leads to a stage transition where we use shadow puppets while the Bible story is being told. 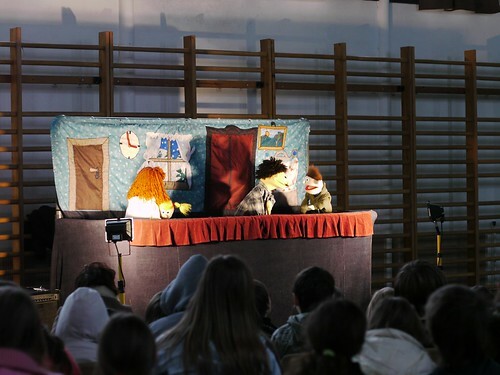 Above: We are thankful for the high quality of the puppets and stage that are designed by the Christian non-profit organization in Hungary. Above: Miki asked one of the young boys who is known to struggle with behavioral problems to help us as we closed with our final Christmas song. You could see his surprise that he was entrusted with such a task and he did a great job doing all the motions as we finished our show. Praise God for helping all the kids pay attention throughout the show and clearly understand as they gave answers to Miki’s questions afterwards. 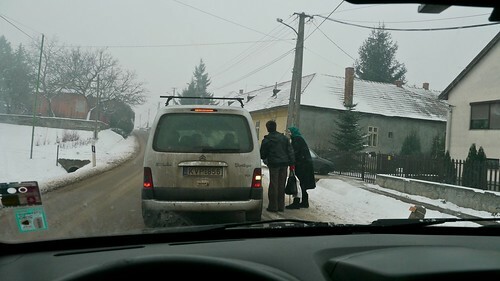 Above: Miki pulling over to ask some locals directions to our next destination in Szurdopüspöki. 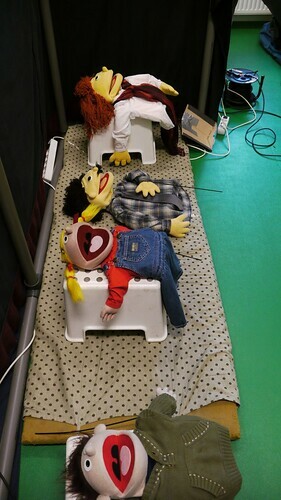 Above: The puppets have been treated with the skilled hands of their personal hair stylist Brenda the past few weeks. Above: The principal (left) and the mayor of the town saying a few words before our show. This is a bit of a “reunion” for us as we were greeted with this newly appointed principal. The last time we met was years ago when we first served in this school. However, we were not invited back because the principal at that time had issues with what we were presenting. 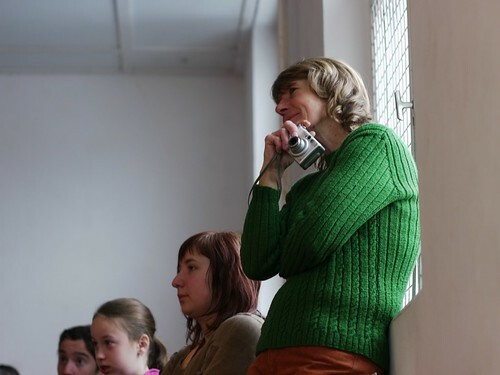 The new principal told us that she was deeply moved by what we presented years ago and always wanted us to return. She told us how one of the kids from another school that she knew listened to the CD that we gave her over and over again. It was one of her favorites. Now that she had become principal, she thought of us and invited our team to once gain begin serving in her school. Praise God for his sovereignty at work to once again open the door to this small town. 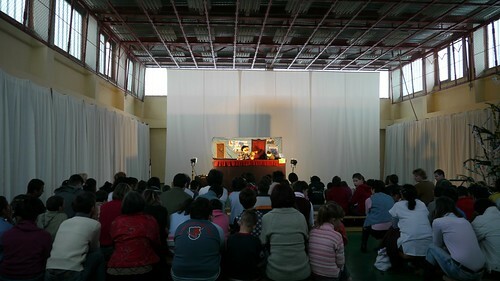 This was a very encouraging last performance as we were warmly welcomed not only by the students but by all the teachers! Praise God. 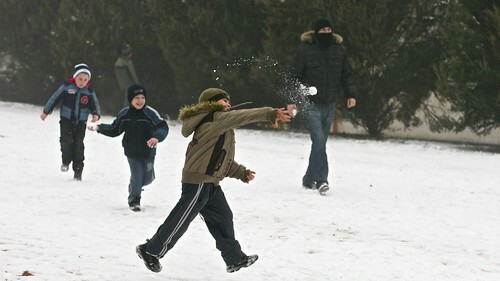 Above: As we were heading out, Norbi and Peti instigated a snow ball fight. Of course the kids were glad to quickly rush and join in the attack! Above: Peti using Miki as a human shield. 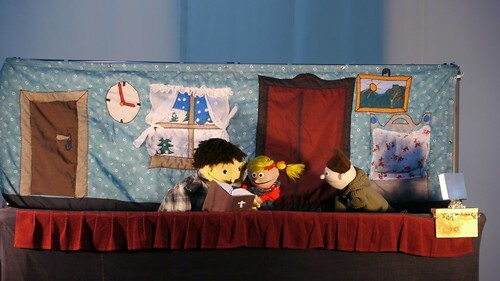 Thank you all for you prayers for us throughout this Christmas Puppet Ministry! You have been a source of encouragement as we went out each day knowing that you were lifting us up. 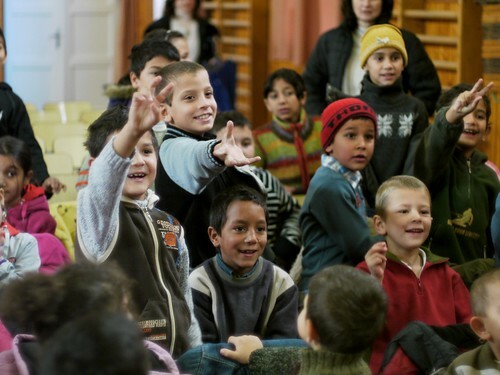 Although this was one of the toughest schedules to date for our puppet ministry, we had very few problems and God enabled us to sow seeds to over 1600 children and many teachers throughout this region. May these seeds produce fruit in the hearts of many, that they may know the blessing of having a restored relationship of peace with God through Jesus Christ. 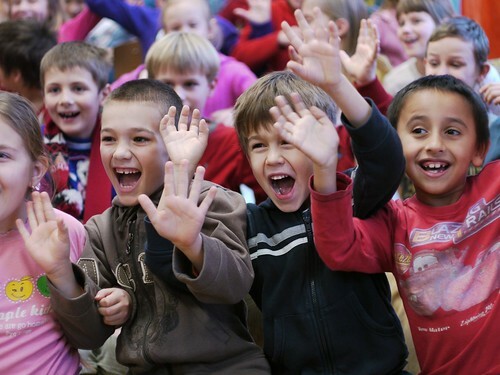 Obviously, this is the place where we see the most familiar faces, as our children attend(ed) this preschool and we have developed relationships with the teachers throughout the years living here. 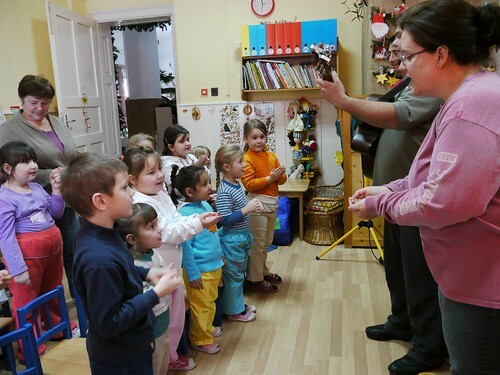 We are thankful for their warm welcome and the children’s excitement as they see “Miki Bacsi” (Uncle Miki) who has also taught them in Bible class the past few years in this preschool. Above: Roger, Miki, Brenda and Sharon. Above: Some of the preschool teachers. Vali (middle) regularly came to our English club last year. 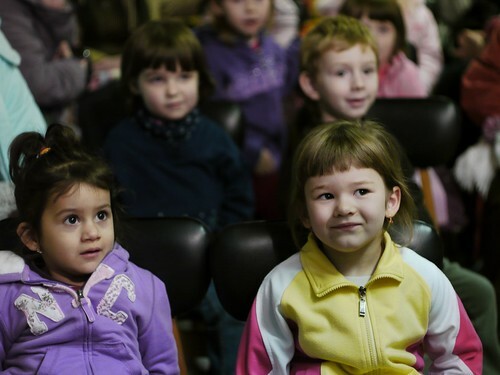 Above: Miki’s son Bence (above) and our daughter Kira currently attend PetÅ‘fibánya’s preschool. 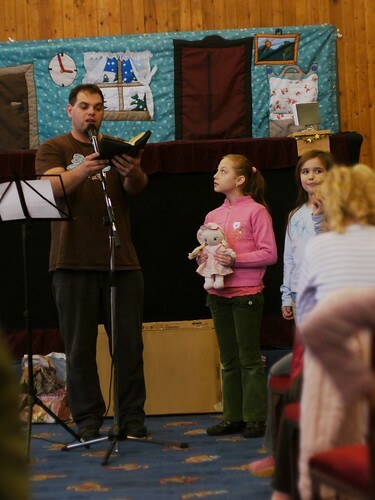 Above: Kira and Elianna helping show the motions to our Christmas song. 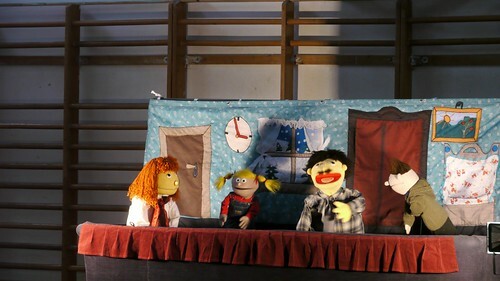 Tomorrow is our last day for our evangelistic Puppet ministry. 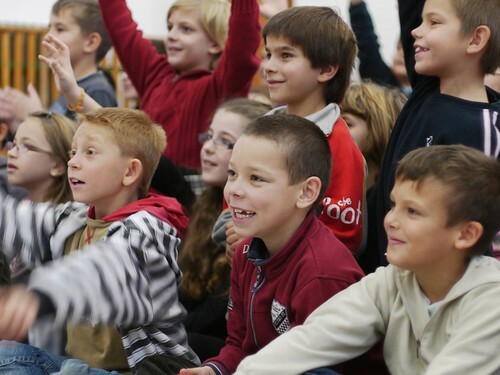 We will be traveling to two schools seeking to sow more seeds and to bring the message of hope in Jesus Christ to a new generation of Hungarians. Thank you all for your continued prayer support! • I wish I could say the whole team is better, but we are still fighting through sickness. Please pray for complete healing. Praise God that most of the kids seem to be coughing less and feeling better each day. 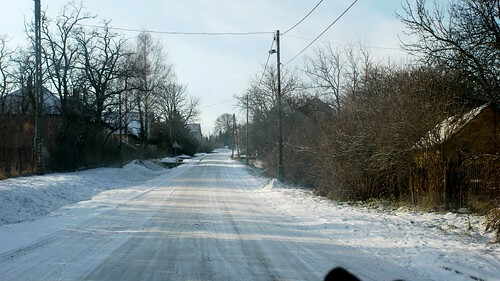 • The temperatures remain below freezing with many roads covered with snow. Please pray for safety in travel tomorrow. • Pray that there would be no issues with the distribution of CDs and magazines that we encountered on Friday. Pray that these materials would reveal God’s truth to children and parents and that He would use them to draw them to Himself. • The intensity of this year’s schedule has really worn us out. Please pray for a good nights rest and refreshed bodies for tomorrow’s shows. Above: Temperatures remain below freezing and we were treated to a winter wonderland view as we traveled to the neighboring village of Selyp. 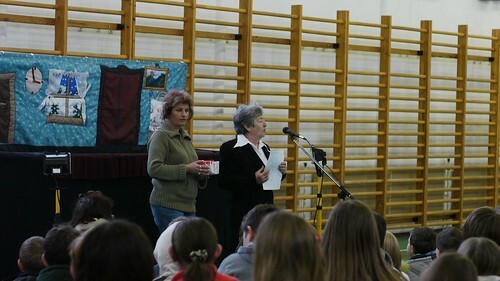 Before the kids entered into the large gym where we set up the stage, a teacher came to speak with Miki. She reservedly informed Miki that we NOT distribute CDs and magazines. She was very apologetic as she shared the reason. 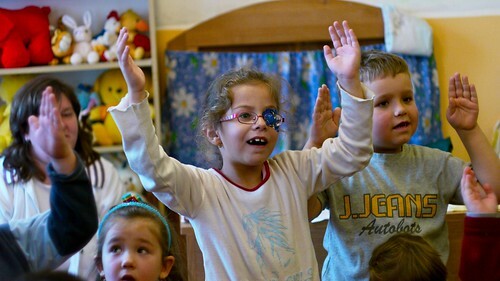 Apparently, a political party in Hungary that recently gained a small number of representatives in parliament have issues with the nondenominational non-profit organization that produces the Christian material we distribute. What is their issue? The non-profit organization supports the equal treatment of Jews in Hungary and the political party speaks openly against Jews. A parent who is also with this political party informed the school that they no longer should allow our materials to be distributed. The teacher told us how she tried her best to explain that all we do is talk about the meaning of Christmas which is a Christian holiday and that we don’t go beyond the Biblical account. Unfortunately that didn’t work. It makes sense to us now why we weren’t able to come to this school last Easter as the same voice influenced a decision that we not be allowed to serve in this school. This is disappointing as this school is located in the very village where we hope to plant another church in the future. 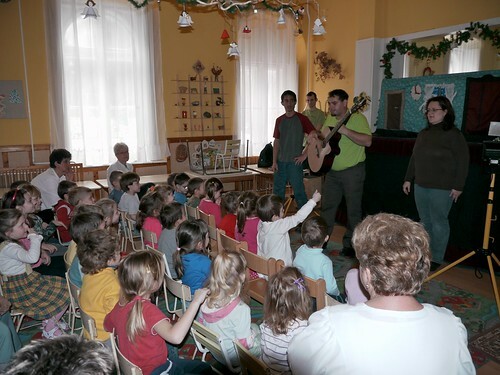 Thankfully, we were able to let the kids know about our weekend “Játszóház” Children’s ministry held in their community center. 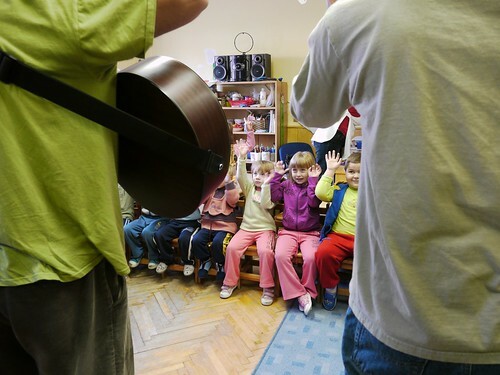 We told them that we would gladly give them the magazines and CD as gifts at the next Játszóház. 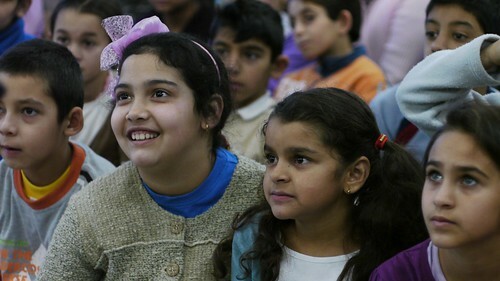 Above: After learning about the opposition to our coming to this school, we were even more thankful for the opportunity to bring the truth of Christmas to the kids here today. We were also thankful for the teacher’s spirit in sharing the bad news with us and her shared sadness at not being able to distribute the gift CDs and magazines that we brought. Above: This girl definitely knows the answer. 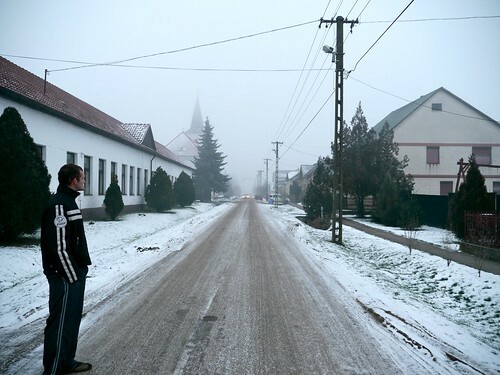 Our last stop for Friday was in our hometown of PetÅ‘fibánya. Out of the 23 schools we are visiting, this is the only school where kids have to get permission slips to see our show. As mentioned above, this may be changing in the coming years as we are facing more opposition. Above: Unfortunately, the kids from our hometown lived up to their reputation as being some of the worst behaved in all the schools we visit. 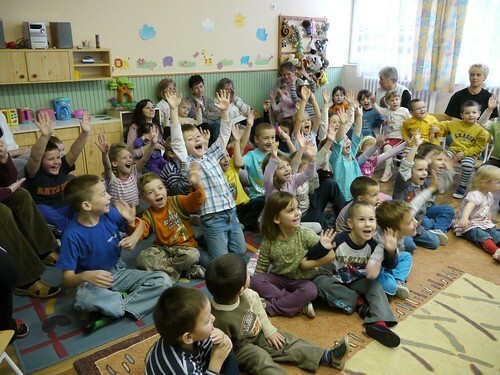 Although there was a teacher present, it was clear that her warnings to the kids meant nothing when they began acting up. 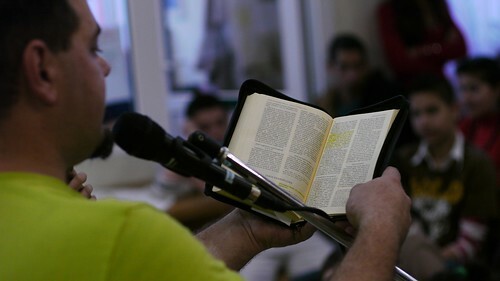 After grabbing a few of the trouble makers and sitting next to them as Miki shared the most important part from God’s word, things calmed down enough for the majority to pay attention. Praise God for the number of kids who were able to get permission from their parents to attend. 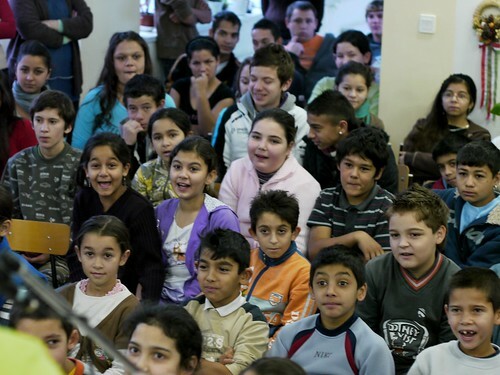 Praise Him for bringing many of these kids to Miki’s Bible class that was held in PetÅ‘fibánya’s public school. Praise God that these kids have an opportunity to hear about God’s love for them and many opportunities through our VBS, children’s ministry and local church to come to know the grace of God through Jesus Christ. • Our team has off tomorrow and could use a refreshing day of rest. 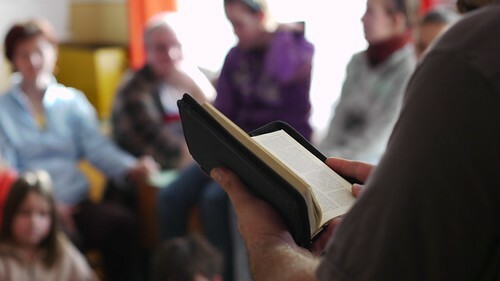 Please continue to pray for healing as the entire team continues to struggle with sickness in varying degrees (sore throat, coughing, sore body). Peti, Sharon, Allen, Miki, Brenda. 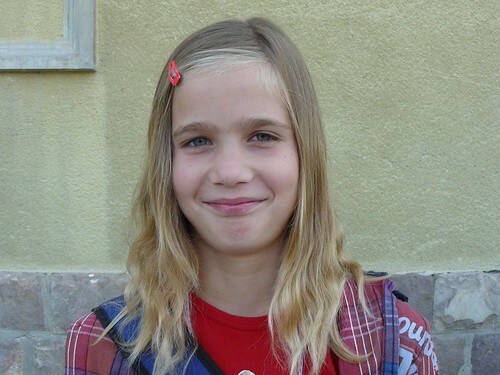 • Pray even now that God would make a way for the doors to remain open in Selyp and LÅ‘rinci so that we could continue to visit these schools every Easter and Christmas. 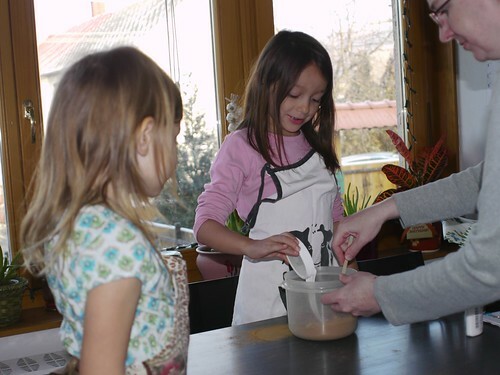 Pray that God would defend the non-profit organization that provides the Christian materials we distribute every year and that He would open doors for these materials to be given to families throughout Hungary. • Please pray for church members DezsÅ‘, Peti and Gabi who will be attending Bible school tomorrow for extension classes. Pray for their safety as the roads will most likely be treacherous. 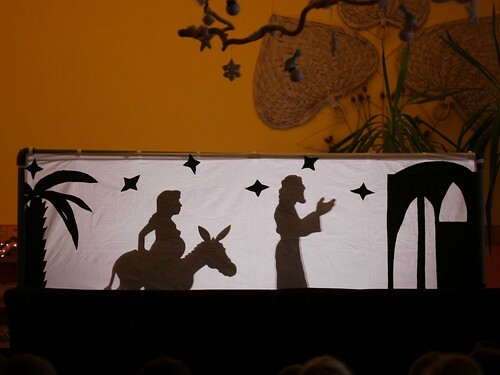 • Please pray for our church’s teen drama team and their performance in our village’s Christmas community gathering in the local community center this Sunday. For the majority of these teens this is their first time performing in front of people. Pray that the gospel message in the drama would be clear and draw more people to Jesus. 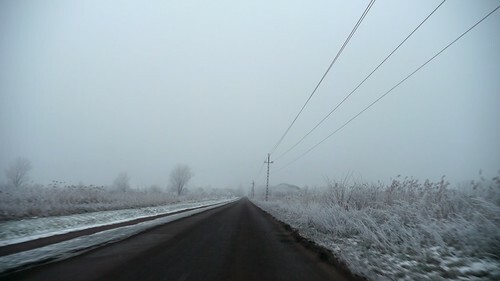 Above: Arriving in Héhalom on a foggy, ice cold day. Above: Were were thankful that church member Peti (top right) could join us as he had off of work today. Above: Miki has been in contact via email with some of these teachers. 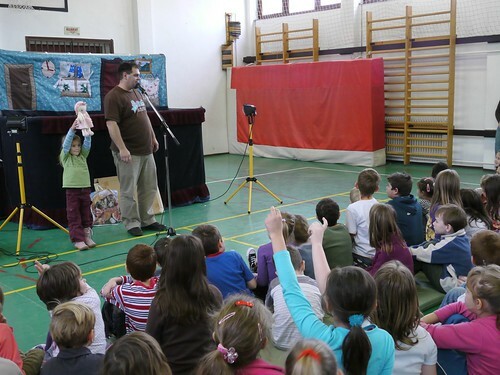 In the past, we have had multiple opportunities to share the Gospel with them after our puppet show. 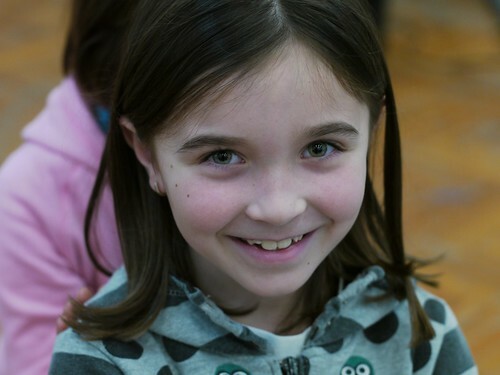 Today, they expressed their thanks for various emails that Miki has sent and even brought one film he sent into school to present to their classes. Above: Some of the sights as we drove through the village of Egyházasdengeleg. 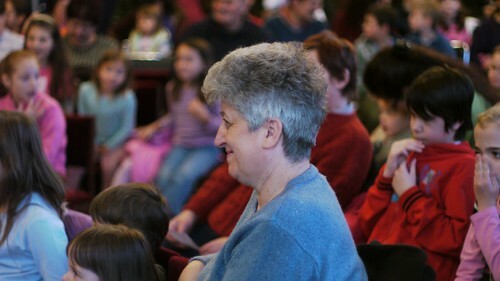 Miki was able to talk to some of the teachers after our show about why we do what we do. He was able to share that our intent was not to establish “our” denomination in other towns, but to spread the Gospel of Jesus Christ. 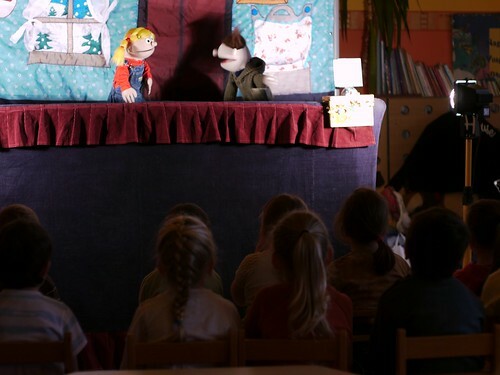 He was able to talk about the non-profit organization that helps equip us with the puppet show materials and how various evangelical denominations work together to share this good news. 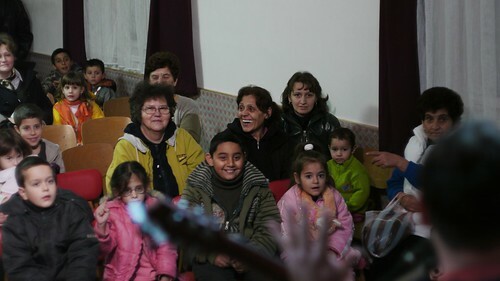 Above: Alina (front center grey sweater) is Peti’s daughter and attends Selyp’s preschool. 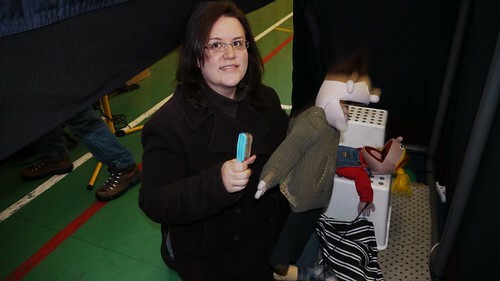 I’m sure it was exciting to see her dad and also to have a special puppet show today. 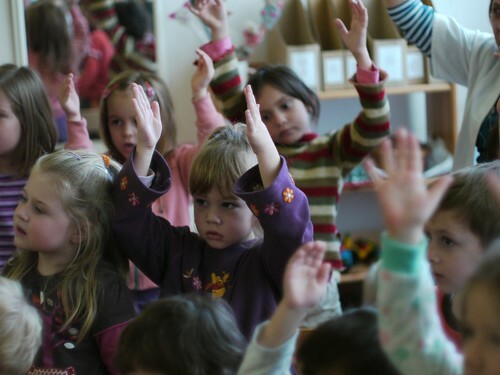 We’re thankful that after attending this preschool for the first time last year, they invited us back. 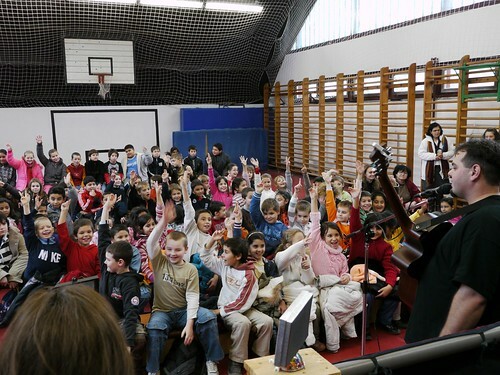 After an afternoon break, our fourth show was quiet a distance away in the town of Vanyarc. 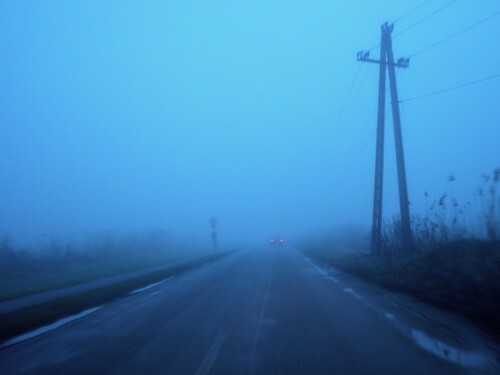 Visibility conditions were terrible and the roads were spotted with snow and ice. Praise God for protecting us in these dangerous conditions as we traveled today! 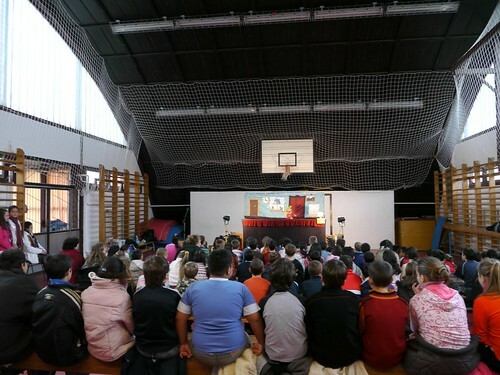 Above: Our show in Vanyarc was actually in the local community center and not connected to a school event. One of the teachers who had previously seen our show invited us to his home town where he is a leader in a local organization seeking to draw families together in his village. We were privileged to be the first program offered to the community by his organization that was recently formed. Praise God for this open door and for the many families who attended who were able to hear the gospel. Praise God that we had a better night’s sleep last night. The girls seem to be doing better and Allen’s headache went away. God gave the team strength to get through the tough schedule of four schools. Thank you for your prayers! • We would appreciate your continued prayers for healing of team members and their families. • Tomorrow we perform in our hometown where kids need permission slips to attend. Please pray that many would obtain those slips and attend the show. • Continue to pray for Miki who has the bulk of responsibility for leading songs and leading the teaching time at each show. 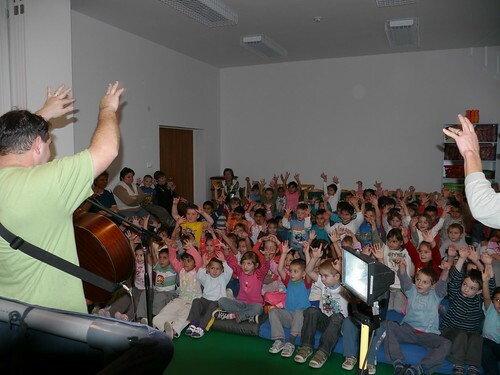 • Pray that the seeds of the Gospel would take root in a new generation of Hungarians and that God would use the evangelistic materials being distributed for His glory. Above: When can memory loss be a blessing? Last night I couldn’t remember whether I had brought in the large speaker and MIki’s guitar from my car to store in our warmer basement overnight. When I checked the trunk, it turns out that I did, but I also happened to see that I had a flat! Praise God that I found this out the night before and not in the morning where we would be pressed for time. I suspect that this flat was from one of the many grand canyon pot holes that we encountered on the back roads that lead to the villages we visited yesterday. Wow, this has been a tough few days for the Mercer ministry mobile. 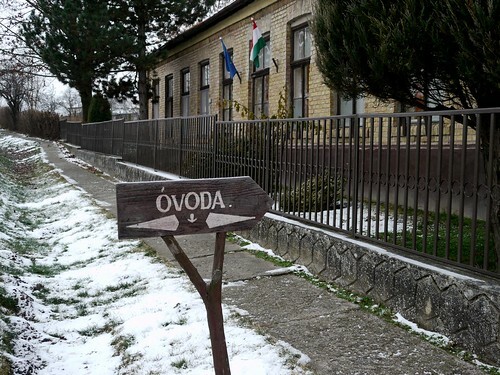 Above: A rustic sign in the town of Szarvasgede with the word “Óvoda” which means preschool. 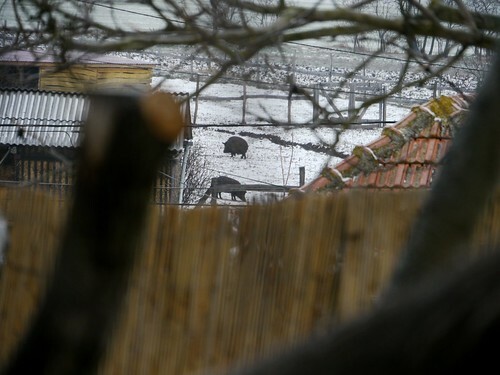 Above: You’re definitely not in the city when you see pigs in backyards. 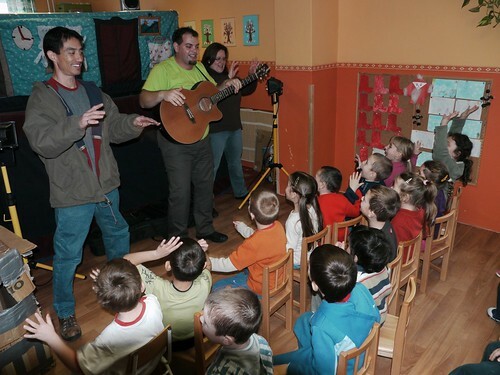 Above: Miki warming up the kids’ imaginations. 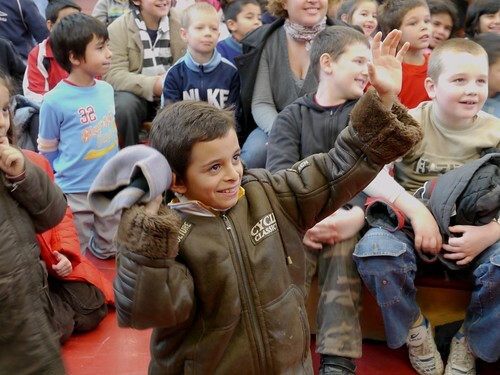 Miki always does a great job interacting with the kids and getting them ready for our Christmas puppet presentation. 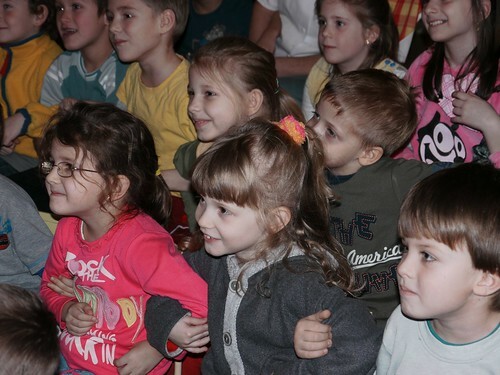 It is always encouraging to see their excitement, singing along with us and their reactions throughout the puppet show. 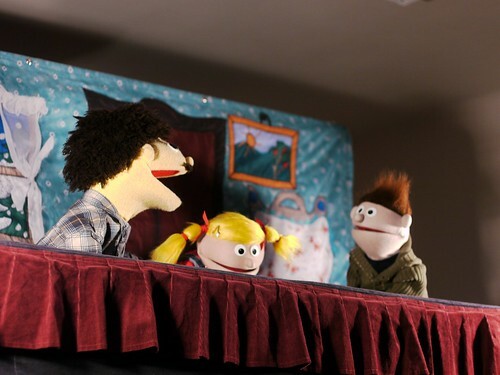 Above: The puppet show tells the story of two kids who initially react negatively when they find out that their family is expecting a new baby. After saddening their mother with their disrespectful response, their father brings their attention to the Christmas story and there being no room at the inn for the Messiah. After hearing their father’s teaching from the Bible about Jesus, they see the error of their ways and ask forgiveness from their mother and share their excitement for the new baby. 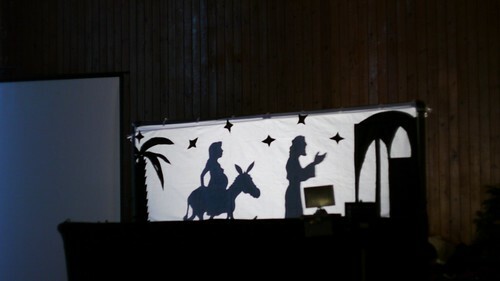 Above: Miki using various props to help in teaching that Jesus is the light of the world. 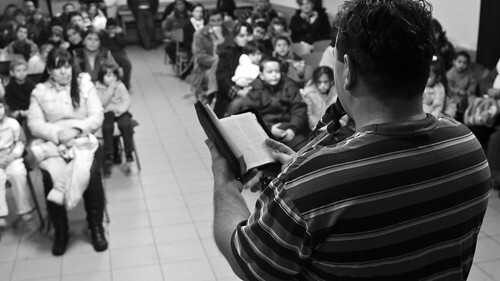 He has been giving a basic gospel presentation at each school we visit. Praise God for these open doors! 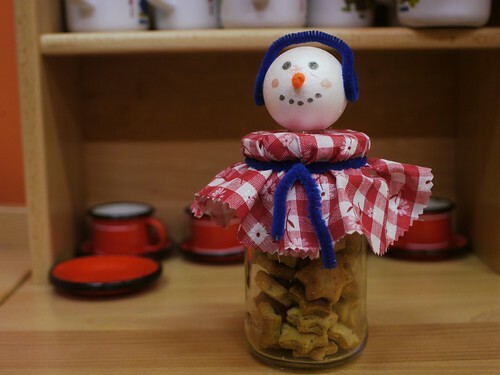 Above: The teachers and kids gave us this gift snowman before we left Szarvasgede. Praise God for his continued help, giving us strength for ministry and spreading the good news of Jesus to these children and teachers today. Praise Him for kids who were able to pay attention and did a great job at question and answer time. Praise Him for finding the flat tire last night and being able to put on a full size spare that worked fine for travel in the morning. Praise Him for being able to replace the tire today (not so easy in Hungary). I praise HIm for all of you who continue to lift us up in prayer, we appreciate you all. • Continue to pray for healing! Norbi arrived this morning with a sore throat and coughing. Brenda is doing a bit better but still sick. Allen isn’t feeling 100% and is suffering from headaches (which is very abnormal for him). Kids are doing a bit better, but still struggling with coughing. • Strength for a tough day tomorrow. 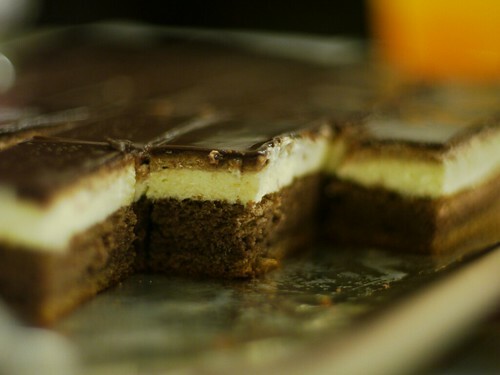 We are nearing the end of the week, and feeling a bit fatigued. Tomorrow we will be visiting four schools instead of just two schools. Please pray for strength! 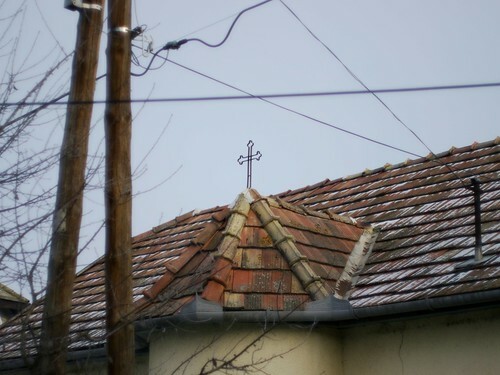 • Continue to pray for clear presentations of the Gospel and for God to use the distributed evangelistic materials to reveal Himself to families. Above: After steady snowfall last night, the roads were completely covered and slippery. 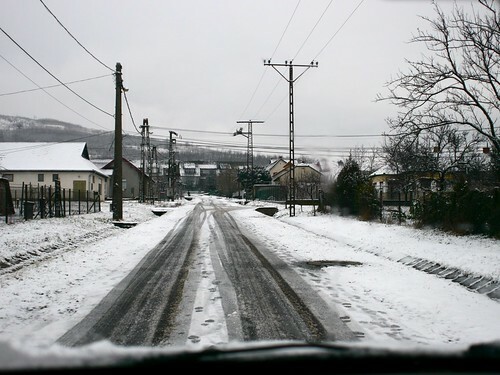 Since the schools we travel to are located in smaller towns and villages, the roads aren’t plowed. This slowed our travel down, however God was gracious to get us to each destination on time and in one piece. Above: Santa sighting. 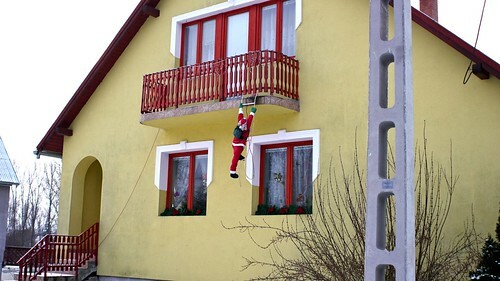 We see these stuffed Santa figures hanging from houses in every town we visit. Looks like he’s in trouble! 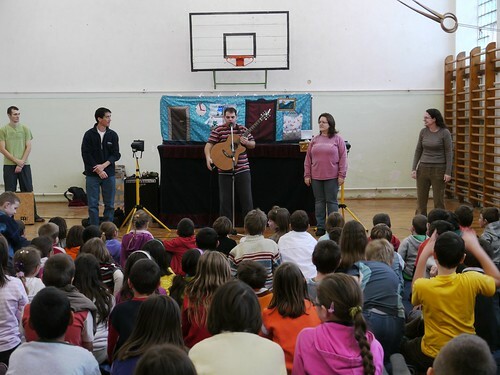 Above: Our first show was in the town of ErdÅ‘tarcsa. We have traveled to this area since beginning our puppet ministry seven years ago! Above: A mother keeps her daughter company through today’s show. 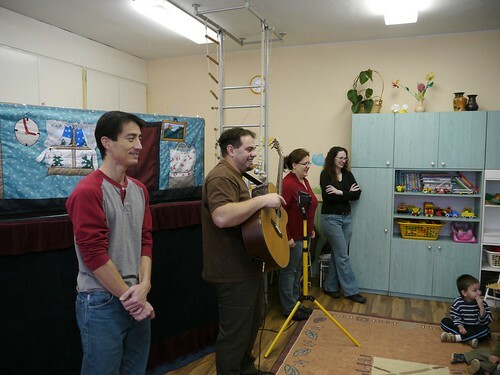 Above: The teachers recorded the song we sang in order to sing it later with the kids. Above: Giving out magazines and CDs for the kids after the show. 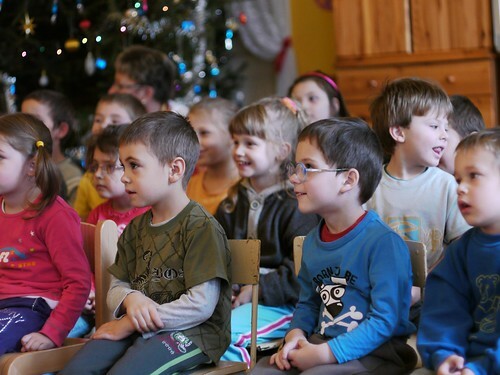 It is already amazing that the door is open to teach the true meaning of Christmas and Easter in these public schools, but even greater that we can distribute quality materials in Hungarian to these kids to hear in their homes. Praise God for the open door to sow these seeds! Above: Norbi huffing and puffing after joining the guys helping my car reach the top of a snowy hill with a push. 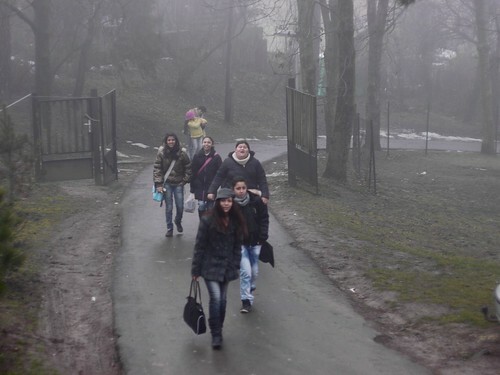 Some of the schools we travel to have awkward entrances which become even more difficult to navigate in the snow. Praise God the car didn’t get stuck on the steep hill, and a simple push was enough to get momentum up the hill. 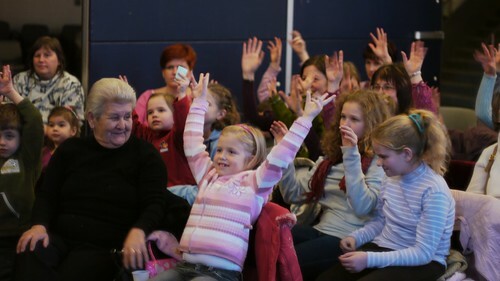 Above: Today’s show in ErdÅ‘kürt was a mix of preschool and middle school kids. 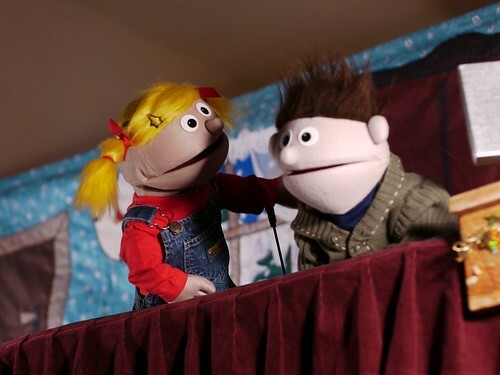 We are more than midway through our schedule for this year’s Christmas puppet ministry and thankful for the team God has formed for this work and for you who are supporting us through prayer! • Please continue to pray for those who are sick (Brenda, Elianna, Kira and the rest of the team who are fighting off sickness). Thankfully, Brenda was able to hold back her coughing attacks in the midst of our show today. 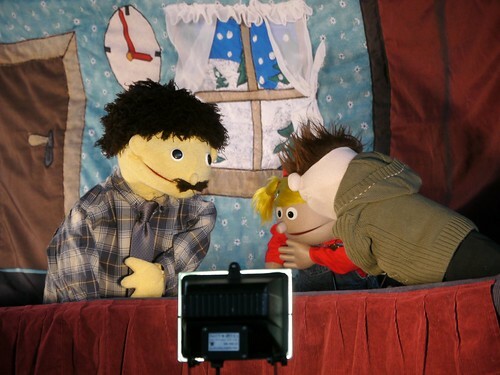 It is kind of hard to muffle a cough as you are holding one arm and a puppet straight up behind the stage. • Sleep. Today Kira told me with excitement, “Daddy, last night Jesus really did help me not to have scary dreams” Pray for all of us to rest well. • Road conditions may remain slippery as temperatures drop, please pray for safety as we travel from school to school. • Pray for the kids especially at question-answer/teaching time. 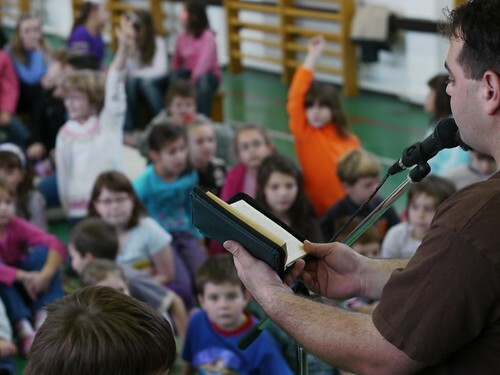 Pray that the time would be free of distraction and that the kids would grasp what is being shared by Miki from God’s Word. 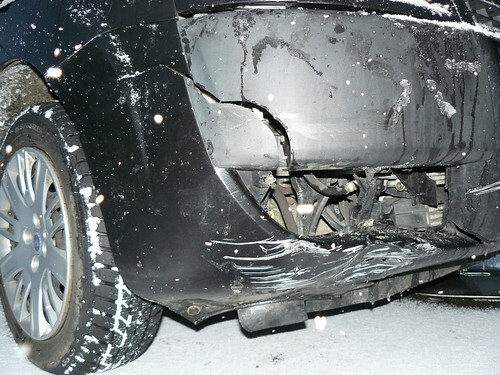 Above: The result of Saturday’s fender bender. Thankfully our car is fully functional (except for windshield washing fluid). 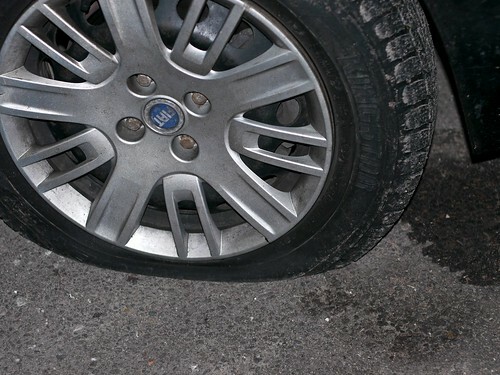 As we traveled to Kálló this morning, we hit a large pothole, the steering became difficult and I was certain a tire blew out. After safely pulling over to the side of the road and circling the car, there was no apparent damage. I started the car back up, and God was gracious in fixing whatever was wrong. The car worked completely fine the rest of the day! Praise Him! 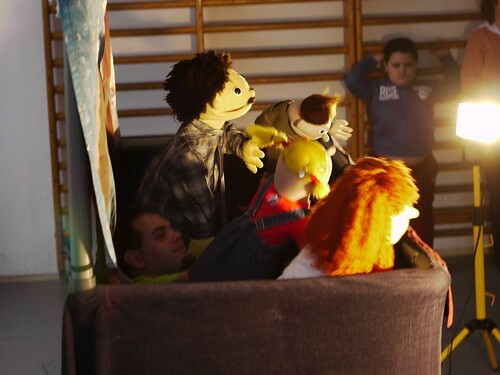 Above: Behind the scenes with our puppets waiting for the show to begin. Above: Let’s get some imaginary snowfall in this place! Above: Hold on tight, we’re going sledding. 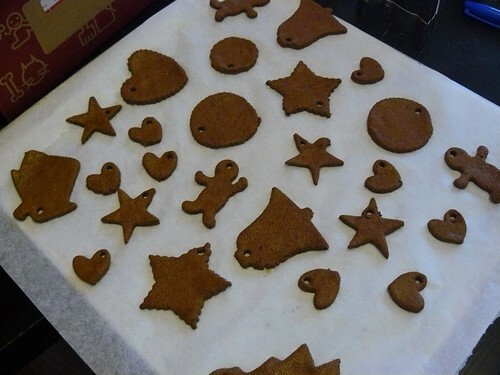 Above: After the show, the teachers offered tea, coffee and fresh hungarian biscuits. 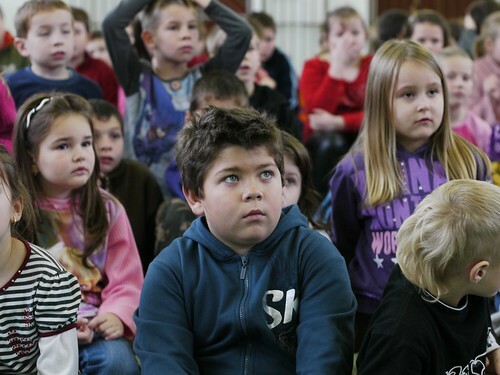 Above: You’ll see this as you enter a Hungarian preschool. Each pocket has a symbol that the kids receive each year (since they can’t read). 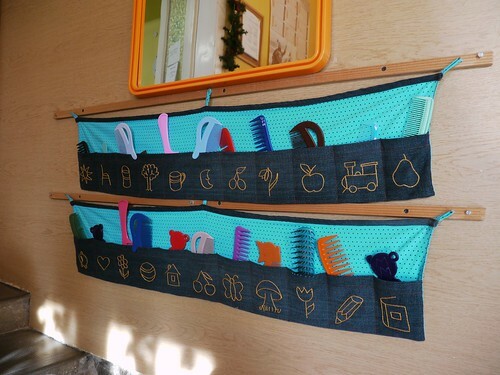 I thought this hand sewn brush holder was pretty creative. What symbol do you want? 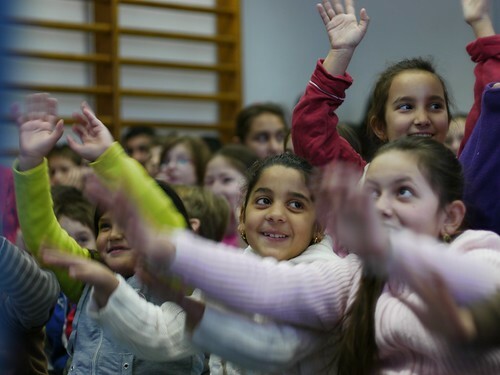 Above: Miki and Erika’s daughter Anna (left) helping entertain the kids in Nagykökényes before the show. Above: Overall this was a great day! 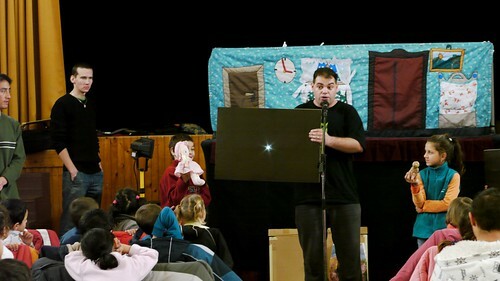 All technical equipment is working well, the puppet show was well received and children and teachers are singing along with us. Praise God for his protection as we traveled today and for giving us the strength and open door to serve Him by sharing His good news. We are very thankful for your prayers for us and for this ministry! • Thank you all for paying for those who are sick. Please continue to pray for Brenda, Elianna and Kira. Elianna’s croupy cough has gone away being replaced with more productive cough. However, this coughing continues to wake her and her sister (and us) up multiple times through the night. Pray also for the entire team. I think we are all fighting sickness to varying degrees right now. • The road conditions may be getting worse as the temperatures are dropping and there is snow in the forecast. Please pray for safety as we travel to multiple schools and for us to get to each destination on time. • Please pray that we and our families would get a good night’s rest and have renewed strength in the morning by God’s grace. • Pray that there would be open doors to talk with teachers more about the Gospel. 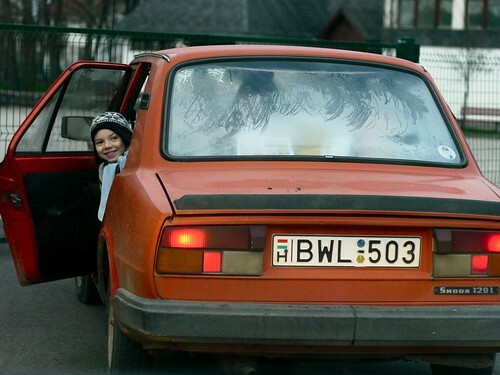 Above: Miki’s son Bence peeking out of the car as we wait for the school to open the gate. 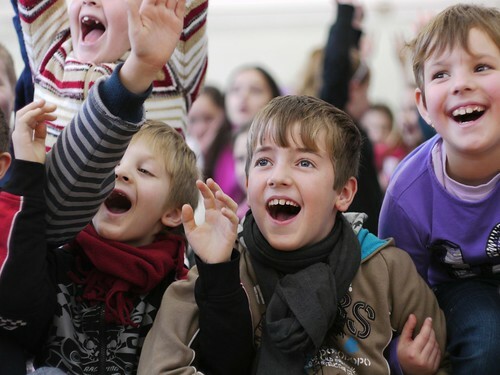 Above: Greeted by kids who are growing up. Mercedes (above left) in our VBS two years ago, and pictured (above right) this morning at our puppet show. 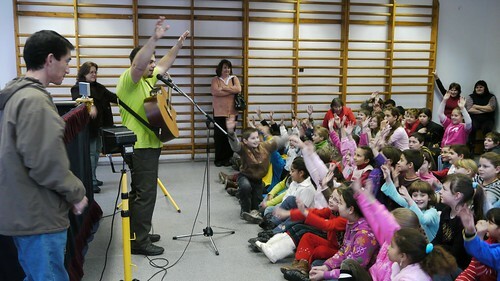 Although Heréd is about a 15 drive from PetÅ‘fibánya, the news spread about our VBS and we have had kids from this area attend year after year. 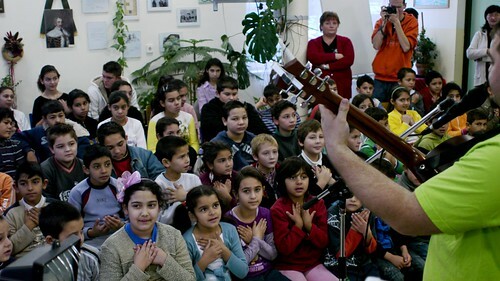 This town has also invited us to perform concerts for kids and even a Bible study. This may just be another area in the future where God uses our church to plant more churches. Above: Drum roll... how many Hungarians does it take to fix a malfunctioning microphone? Well, today it took three. 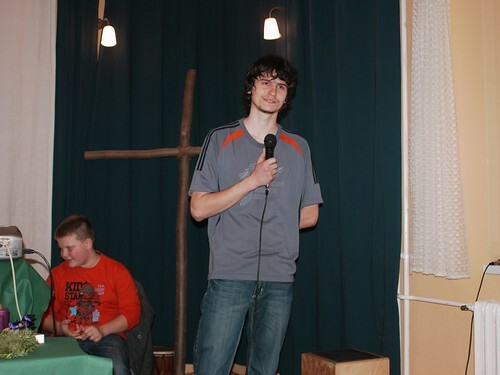 Thankfully, God gave Peti the wisdom to finally figure out why the mic wasn’t working and fixed it by the time the show started. 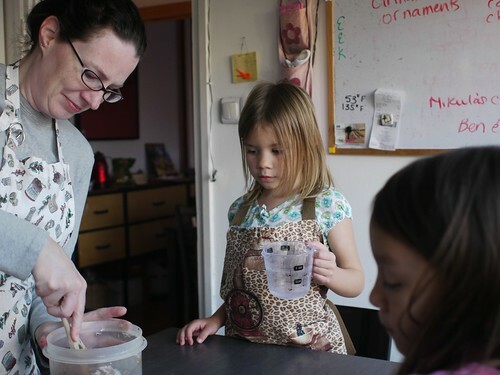 Above: Kira helping Miki at teaching time. 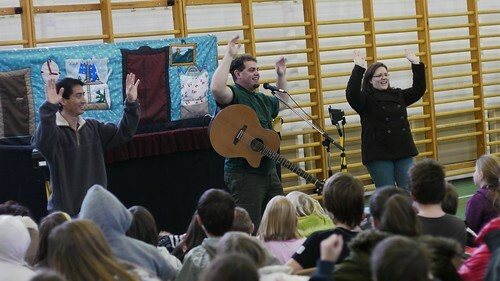 We praise God for the success of today’s show and for the delivering of the Gospel message to over 100 kids today. • As some of you heard via email, Elianna had a tough bought with croup cough last night and had issues breathing. After treating her with some humid air, then cold air then of course, lots of prayer, God was gracious to allow her to get back to sleep last night. Today, she continues to have a pretty ugly sounding cough which indicates that tonight may be tough again. Please pray for her. 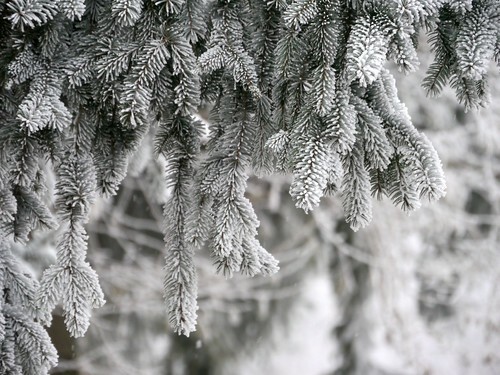 • Brenda continues to struggle with a cold, please pray for healing and the ability to sleep well. • Snow fall and icy roads all helped our car slip and slide into a guard rail later on in the day after the show. Praise God no one was injured (except the car and the guard rail :) Our teammate Miki was able to do some twisting and bending of metal to make the car drivable, but it definitely needs serious repair now. Since this is the main vehicle that we pack our stage and supplies into for the show, I was very thankful that we will continue to be able to use it. Please pray that it would stay ‘intact’ enough to be stable as our schedule picks up with more intensity next week. Pray also for wisdom as to how to get it repaired. 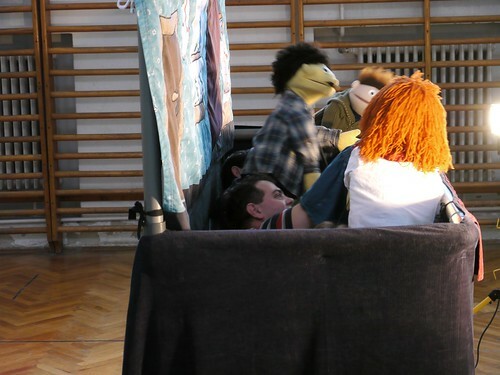 Above: Roger grooming the puppets behind the scenes before the kids arrive. 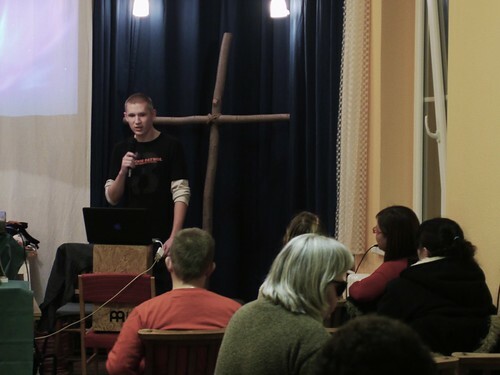 This is only our third time serving in the neighboring town of Zagyvaszántó. 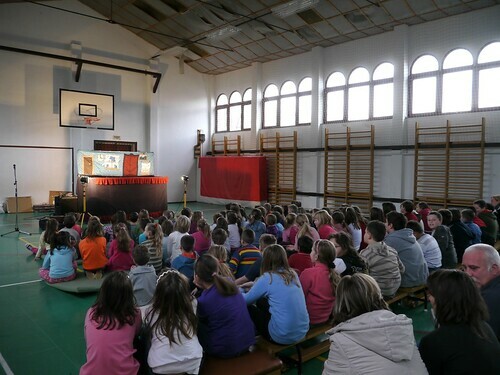 On multiple occasions, this school has either turned us away when we had a scheduled puppet show, or completely forgotten what time we had agreed to in advance to present the show. Today was no different as they expected our show to start half an hour later than what we had agreed to weeks ago. Because we have shows in multiple schools in one day, a half an hour slip in schedule throws everything off. Thankfully, they were gracious in allowing the show to go on earlier than they expected. 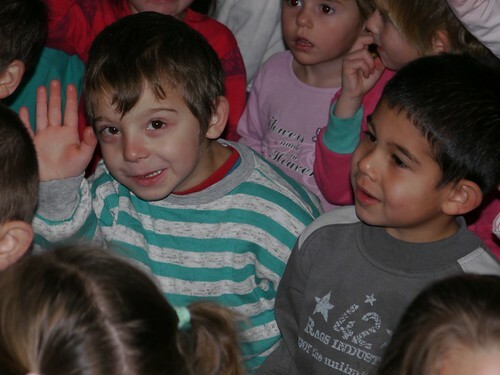 Above: Because Zagyvaszántó is just a 10 minute drive away from our village, we saw many familiar faces of children (like Luca above) who have attended our VBS and other children’s outreaches. Our next stop is also a town that is just 10 minutes away from PetÅ‘fibánya. Although we have served in their middle school in the past, this was our first opportunity to present our show in their preschool. As we were almost done setting up, going through our custom of checking lights, a teacher gasped and said, “Oh, I forgot, we don’t have power right now. We won’t have it until 3:00.” With that, I sped off to our home to find some battery powered speakers while Miki taught the kids our Christmas song. 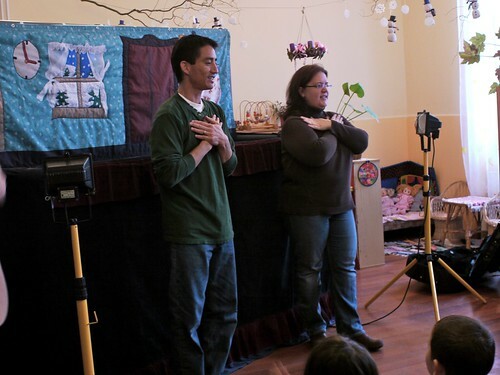 Thankfully the room was small enough that the speakers were adequate for us to present the puppet show. 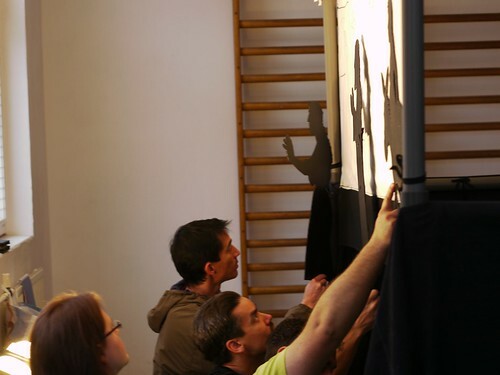 In the most important part of our show, the lights are needed for casting a high contrast shadow. 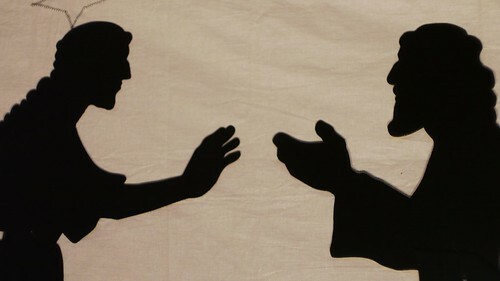 Without power, we simply put the shadow puppets in front of curtain to tell the story (instead of behind the curtain with casted shadows). Although it wasn’t the most professional looking presentation, we were able to present the entire show without power! Praise God in providing wisdom in improvising. 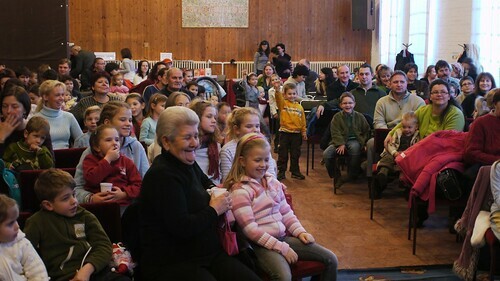 Above: Children and teachers in LÅ‘rinci join in with the motions as Miki, Brenda and Roger present our Christmas song. Some teachers and even kitchen workers crowded around the door to peak in while we were singing. They commented that they would have gladly stayed to watch the entire show if not for other responsibilities. Praise God for such a warm reception! Above: Miki distributing magazines and CDs after the show. With all three schools combined, we saw around 300 kids today! Thankfully, we’ll have tomorrow off and I feel all of us on the team need it for rest. Today team members reported that they had a better nights rest (thanks for praying). 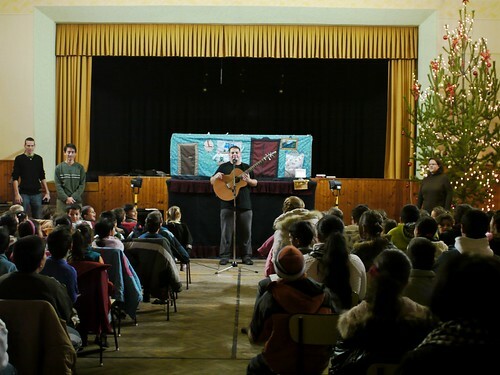 Our next show will be on Saturday in the town of Heréd where we have also already taken children’s ministries multiple times. Please pray for us! 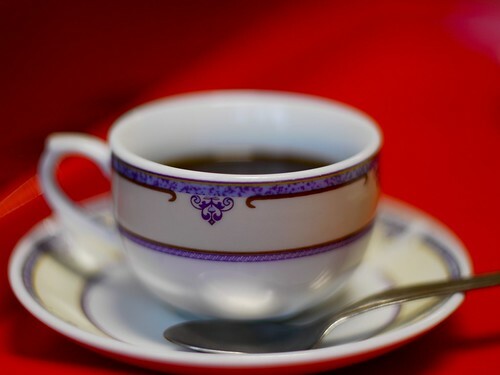 • Physical HEALTH and stamina. • Safety in traveling to and from schools everyday. • Unity, patience, good communication among members and abiding love. • Restful nights of sleep. • Spiritual stamina. That we would be daily built up in prayer and fellowship with one another. • That God would equip us to be the brilliant light of Christ in these spiritually dark areas. Above: Visibility was pretty bad as we set off to Szírák. We praise God for his protection while we traveled and for his help in getting the entire team to Szírák on time. Above L to R: Norbi, Brenda, Roger, Miki and Norbi setting up the stage for today’s show. 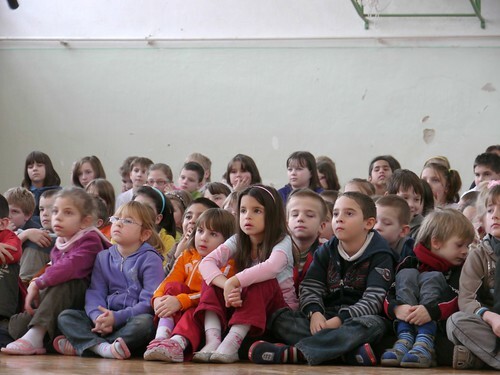 Above: Even the teens from Szírák stayed around for today’s puppet show. 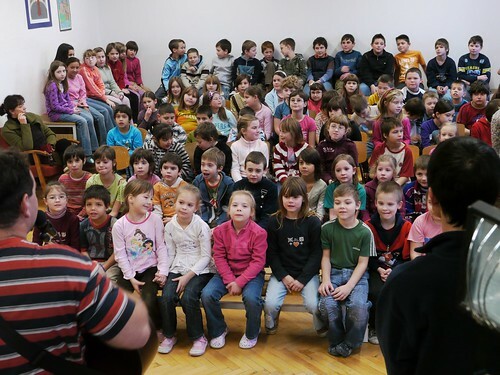 Above: The children in Szírák picked up on the motions to this year’s Christmas song very quickly. 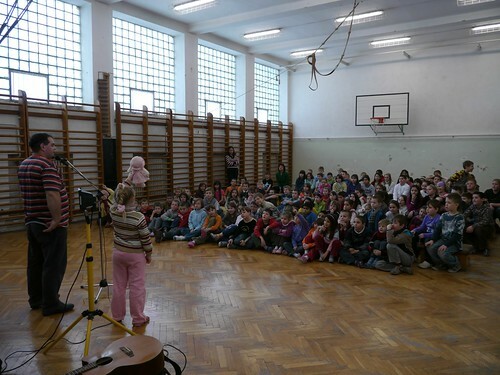 After the show was over, as I was walking through the school’s hallways, I heard some children continuing to sing the song they just learned. 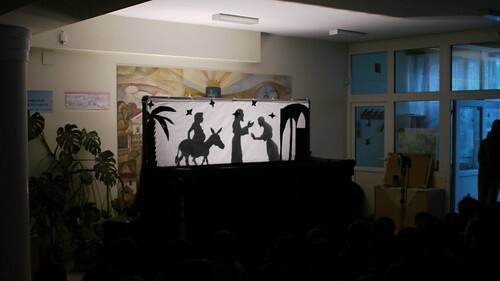 Above: Children watching our shadow puppets tell the story of there being no place for Mary and Joseph at the inn. 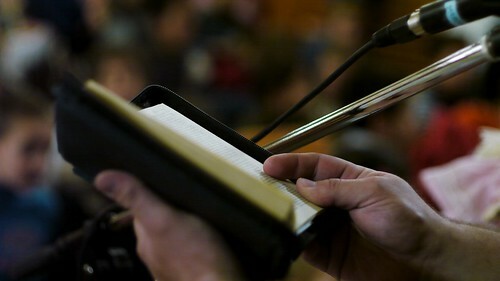 Above: Miki reading out of the book of John. 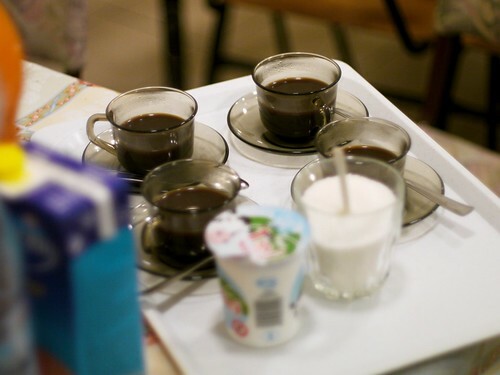 Above: A teacher kindly offers coffee and treats after the show. Above: Our time in the village of Bér was great! 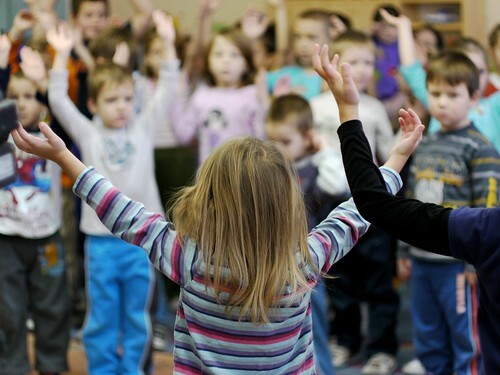 It is so fun to see 3-4 year olds singing along with us and understanding on a basic level that Jesus came into the world to save us from our sin. The teachers in this village were very hospitable and were full of gratitude for our visit. We praise God for these first four days of ministry. He has protected us while we travel, and protected our physical bodies from injury as we pack and unpack heavy equipment. He has kept our team unified, and given us a good name among these schools where we have been welcomed by both kids and teachers. The equipment for the show has been working without any problems and the shows have been presented without distractions. We sense your prayers and God’s hand of blessing in all of these things. Please continue to pray! • Unfortunately, various team members commented on their lack of a good nights rest last night. Because of the intensity of our schedule, we really need our bodies to be refreshed each day. Please pray for all team members (and their children) to sleep well. • Many of us are still fighting or struggling with sickness. Please pray for healing (Brenda, Miki, Peti’s kids, Miki’s kids and our children seem to be continuing to fight sickness). 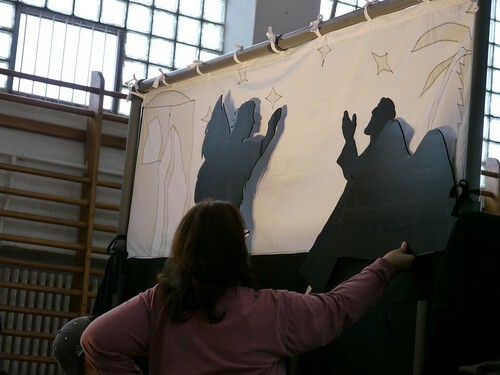 • Today we had a minor part break on one of our shadow puppets. Thankfully it didn’t cause problems in the show. Please pray that all the puppets and props would survive their everyday use and their being packed and unpacked. 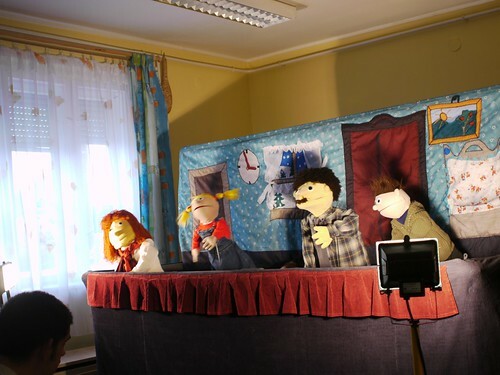 Above: The unseen puppeteers from L to R behind the curtain: Brenda, Miki, Roger and Allen. 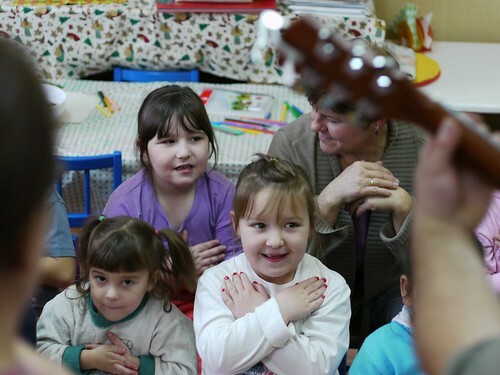 Above: Today we performed in the town of Hatvan in a care center for mentally disabled. 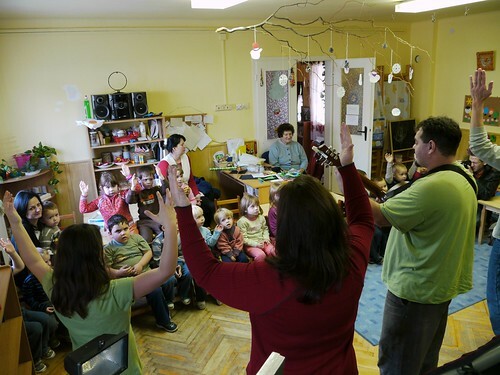 In the first few years attending this care center it was clear that the bright lights, the surprises in the puppet show and our very presence in the small room in which they gathered caused a bit of stress and even fear. Having come here year after year, most of those being cared for now know us by name and are excited as we set up our puppet stage. The girl pictured above center often struggles with crying throughout our entire presentation. We prayed for her before we arrived and saw God help her, especially when the Gospel was being presented. She answered questions, participated in singing and was even upset when we had to leave. Above: Miki leading the way in some imaginary sledding. As you can see, the care-takers were also happy to participate! Above: Singing a song about Christ’s coming into the world. • Many of us are still struggling with sickness. Please pray for healing of team members and their children. 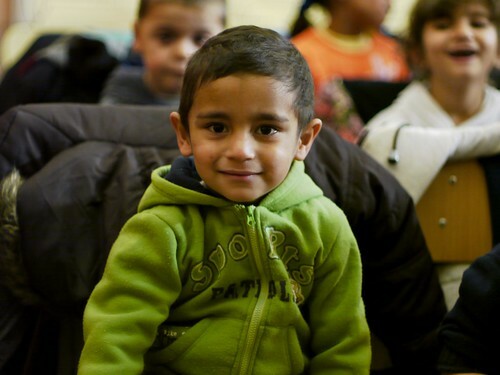 • Tomorrow we visit two schools which involves more travel and time coordination. Please pray for safety and success. • Pray that the message of Christmas and the Gospel that Miki will present will be clearly communicated and understood by the children and teachers. Above: Before being dismissed to children’s Sunday School, the kids huddle together as our church prays for them. Tonight we had six visitors from a village located half an hour away. 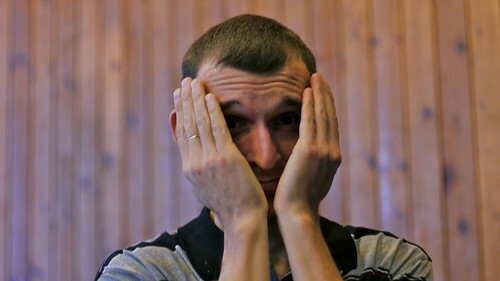 Church member Peti came to know Józsi at his workplace and on the first day of work discovered that Józsi was also a Christian. Józsi then brought his brother Levi and mother Tünde to our baptismal service a few weeks ago. Today, Józsi not only brought his family but three other men. Apparently, the village they live in is very poor, but to see their smiles and joy in Christ is an awesome sign of the treasure they have found in Him. Maybe someday, God will also be pleased to plant a church in their village with their participation. 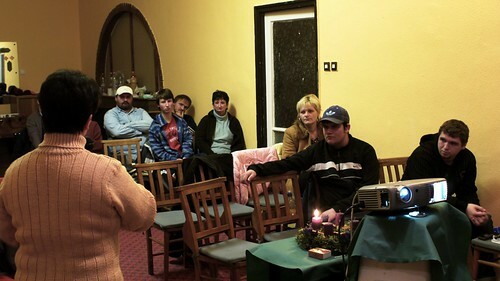 Above: Church member Marika sharing in a time set apart for personal testimonies of how Jesus is at work in our lives. Above: Roland also giving testimony to how God has answered prayers for people at his workplace. Roland and GyÅ‘zÅ‘ (back orange shirt) are two of the five teens who will be participating in a drama team that will perform in PetÅ‘fibánya’s local Christmas program. This is their first experience in outreach and evangelism and they continue to do a great job learning the drama which will be performed in just over two weeks. Above: Gabi, one of the four men attending Bible school from our church, giving a short message on how he is coming to understand God’s grace on a deeper level. 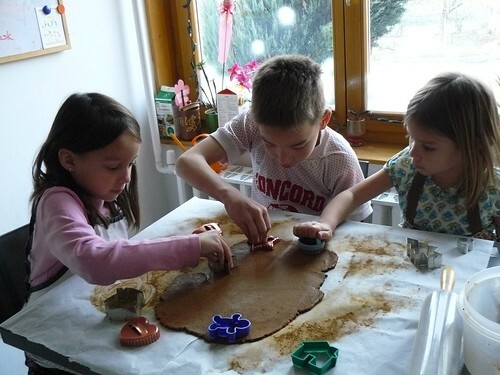 Above: Sharon, Elianna and Kira preparing the goo for cinnamon ornaments. Today, we’ll be taking some time off and resting. 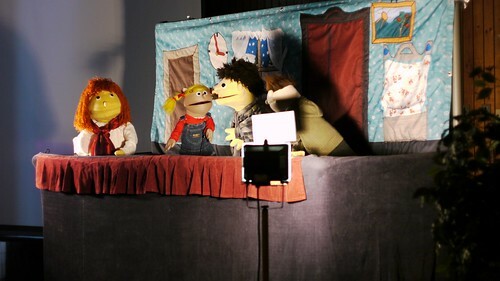 Tomorrow we’re back to traveling to public schools for our evangelistic puppet ministry. Please pray for us! 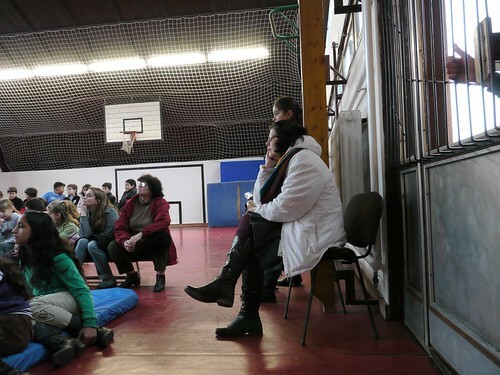 Above: People finding their seats in the Gyöngyös’ local community center. Gyöngyös is a larger city that is on the outskirts of the Northeastern county we serve in. We were thankful for the large turn out on a Saturday and thankful for all the parents that attended with their kids (instead of dropping them off). Above: Church member Peti trying to hide his face before I snap a shot. Peti hopes to travel with us the majority of the time as his work schedule permits. We are thankful for his ability to join us today and help with the heavy lifting of equipment we load in and out of cars. 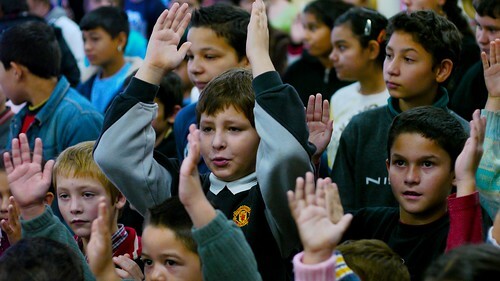 Above: Miki asking the kids to raise their hands to warm up for an imaginary snow ball fight. 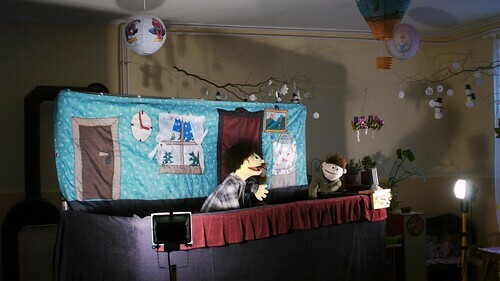 Above: Scenes from our puppet show. 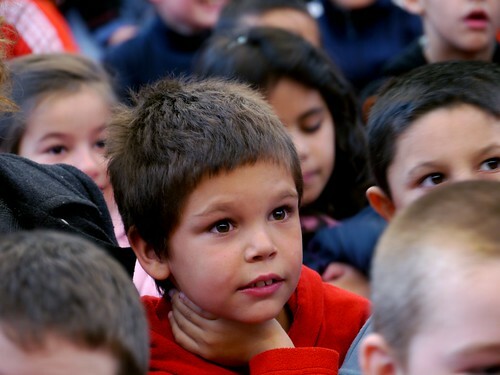 Kids from the show behave disrespectfully at the news of their family expecting a new child. 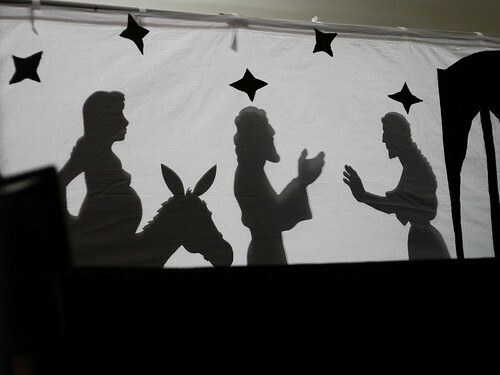 Afterwards their father draws their attention to the story of Jesus’ birth and how there was no room for him. 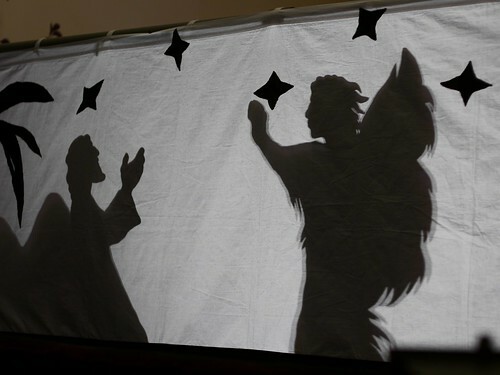 This is when we transition into shadow puppets and are able to share the true message of Christmas from the Bible. Afterwards, the puppets come back on the stage and in response to their father’s gentle correction ask forgiveness from their mother. Above: Afterwards Miki shares the message of hope that all can have in Christ if they put their faith in Him. The kids enjoy volunteering holding different props that Miki uses to illustrate various reasons why faith in Jesus Christ is so important. • Roads were clear for travel. • Although team members left at different times, we converged at the community center in time. • Great turn out of kids and parents to hear the truth about Christ and Christmas. 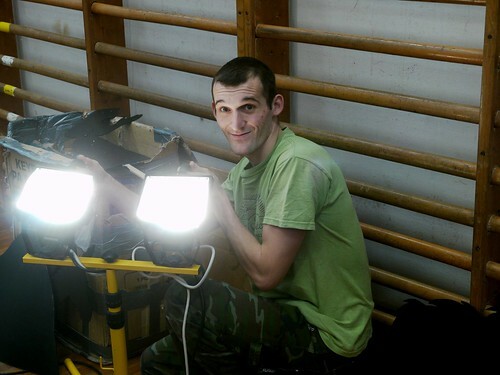 • All equipment worked without any problems and the show was free of distractions. • Good nights sleep last night. • A rest filled Sunday and encouraging time of fellowship and worship at church tomorrow. Above: After a time of morning prayer together, we packed up our vehicle and set off on the snow covered roads to Gyöngyös. By the time we got to the highway, the snow had become rain and the conditions improved significantly. 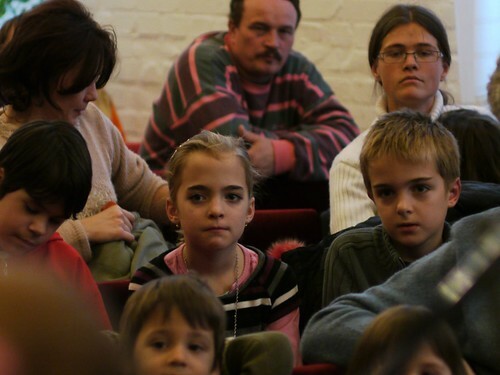 Above: These young preschoolers were some of the first to enter single file into the auditorium. Soon after, the middle school children joined the fun. All together there were over 180 kids today. Above: When we entered the building to set up, I realized I had forgotten to bring our super long extension cord that is always needed in large auditoriums like this. Thankfully, there were maintenance men helping set up the Christmas tree at the time who provided another extension cord. 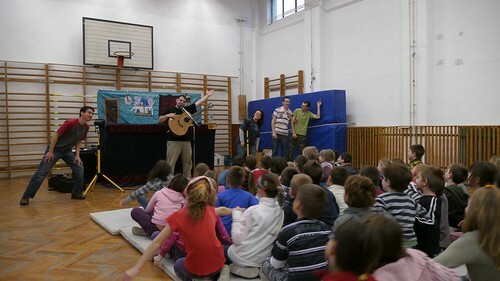 All the equipment worked well and the the puppet show captured the attention of both the preschoolers and the middle school kids. Above: Miki illustrating the brilliance of light in the midst of darkness. 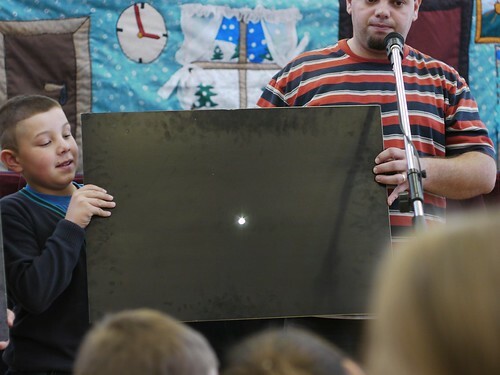 The various props that he used in his teaching really engaged the kids and help them to understand various truths about the coming of Christ into the world. Above: Distributing CD’s and magazines that share the good news of Jesus. Praise God for providing the money needed to purchase over 1600 of these through supporters. 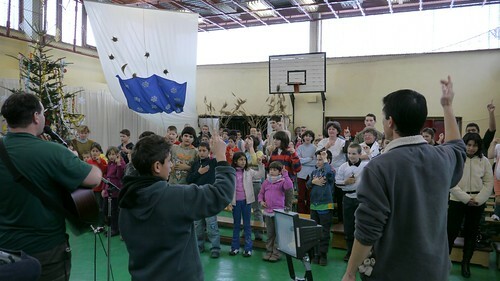 Above: Some of the middle school kids after the show. 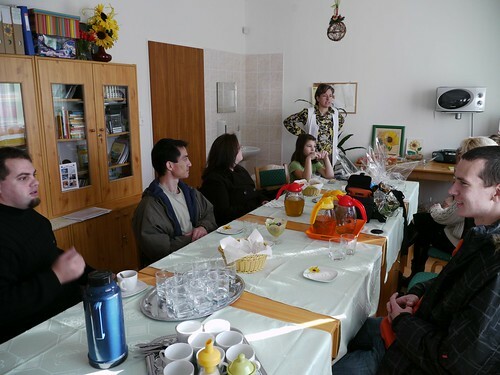 Above: As is customary at many of the schools we visit, the principle invited us to the teachers lounge after the show for coffee and tea. 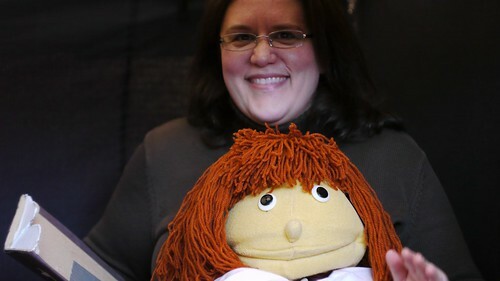 As teachers finished off their cigarettes and we waited for our beverages to cool down, God opened up a door for Miki to share about the reason we do this puppet ministry. He commented on the hope we want to give to children. One teacher said that she also needed hope. Miki then began talking about the hope that all can find in Jesus. He spoke about the amazing truth that Jesus was willing to die for the worst of sinners and that anyone can experience His forgiveness of sins and salvation. Before leaving we were able to give them the address to our photo website and our church website. • Road conditions improved quickly and God protected us as we traveled. • The show (even though I forgot an extension cord) went well without any problems. 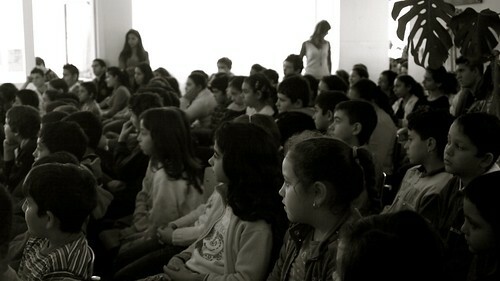 • The kids payed attention and the older kids didn’t seem bored or inclined to distract others in the midst of the show. • The teachers were clearly grateful and God opened up a door for Miki to share more about Jesus with them after the show. • The team is unified and serving with joy. • Please pray for healing as teammates Brenda and Miki are suffering from headaches (maybe a cold). Our son Benjamin also came down with a slight fever today and isn not feeling well. • Pray for a solid night’s rest for the team tonight. 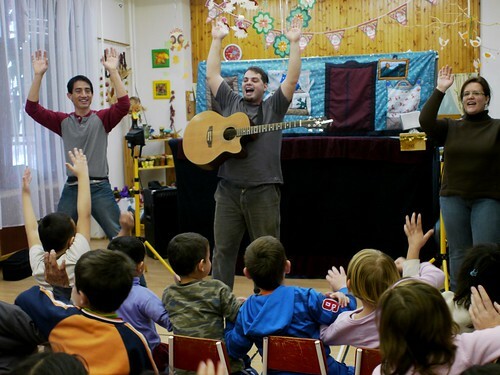 • Tomorrow’s show is in Gyöngyös again but at the local community center. Please pray that God would not only speak to the kids through this presentation, but to the parents who will be attending as well.